If you want to catch a lot of really nice fish then the place to do it is Port Renfrew on the west coast of Vancouver Island. In the summer months, catching 50 plus fish a day is not uncommon. 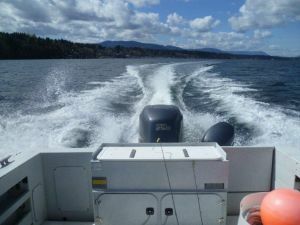 You can expect to catch large Chinook Salmon up to 50 pounds, plenty of aggressive Coho and some really nice Halibut. We generally leave the dock out of Port Renfrew around 6 A.M, drop the crab traps and head up the coast to the world renown fishing grounds that Port Renfrew has to offer. When we arrive the fishing is on and it doesn’t take long until your arms are aching and there are fish in the cooler. We fish for salmon and bottomfish into the afternoon and are back in at the dock around 3 P.M. or so. Your fish and crab is then cleaned or filleted depending on your request and ready to have bagged or processed. Great times await at Tyee Tom’s Fishing Charters.